After helping with a teen program that featured history of garment workers and “upcycling,” making things out of old clothes, this has become renewed interest of mine. There are many websites showing ideas of things to make. Pockets from old jeans is a favorite item of mine to use. 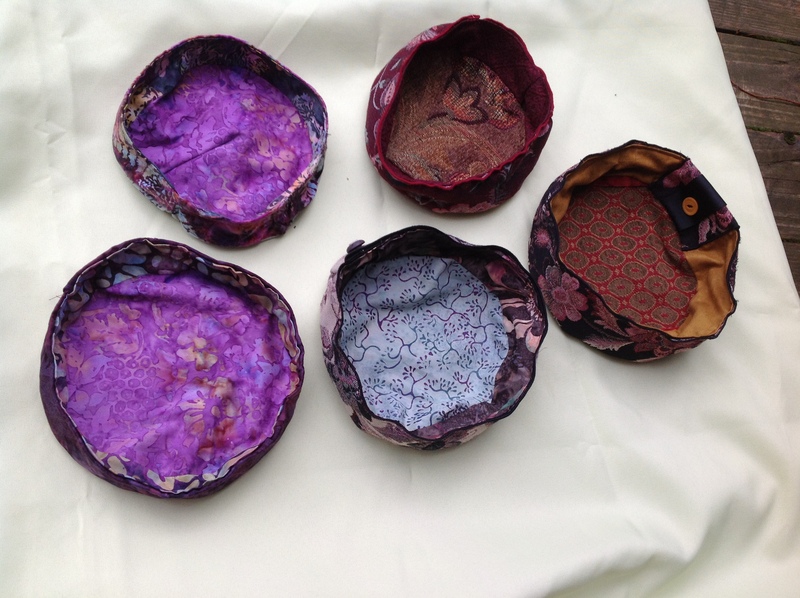 I began to make yarmulkes from upholstery fabric scraps. The examples shown here show the three styles: lower left, based on the pattern of the cloth or in this case, a vintage piecework hand-stitched onto the top, The three central ones have a design cut from cloth and hand-stitched onto the top made of the words: “Know before Whom you stand.” The one on the lower right has the same design machine-embroidered on it. They are lined with cotton batik fabric. There are more in my collection, and the most recent ones are basted together so they can be sewn to the customer’s size. The ones with hand-stitched letters are 110.00, the machine-stitched 80.00 and a few others cost 60.00. 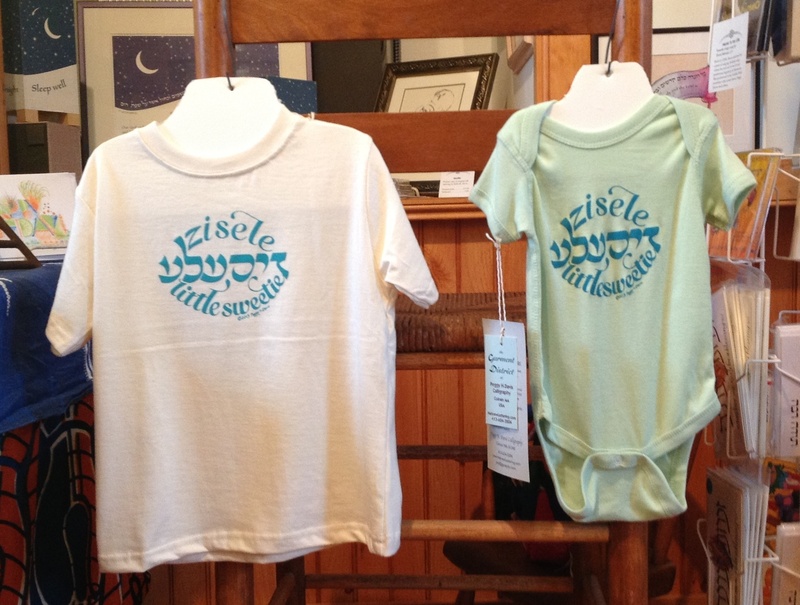 Sizes: Onesies come in newborn, 6 mo., 12 mo., 18 mo., T-shirts are sized in 2T, 3T, 4T, 5/6. Cost: $25 for one shirt, $3 shipping. $25 each for 2 or more shirts with free shipping. 10% DISCOUNT THROUGH THANKSGIVING FOR ANYTHING FROM MY WEBSITE OR BLOG. Call me at 413-624-3204 to order. The shirt was screen-printed locally by Moonlight Designs in Greenfield MA. The lettering was inspired by hearing a podcast interview with the designer Louise Fili, then perusing her books showing the signage and label lettering from the Art Nouveau and Art Deco periods in Europe that inspire her work. Here are more items from our gallery. New this year: four magnet designs: Earth Hamsa, Garden Hamsa,the Bridge of Flowers of Shelburne Falls from a colored pencil drawing, and the Shelburne Falls trolley, photo by Joe Kurland. $2.00 each. 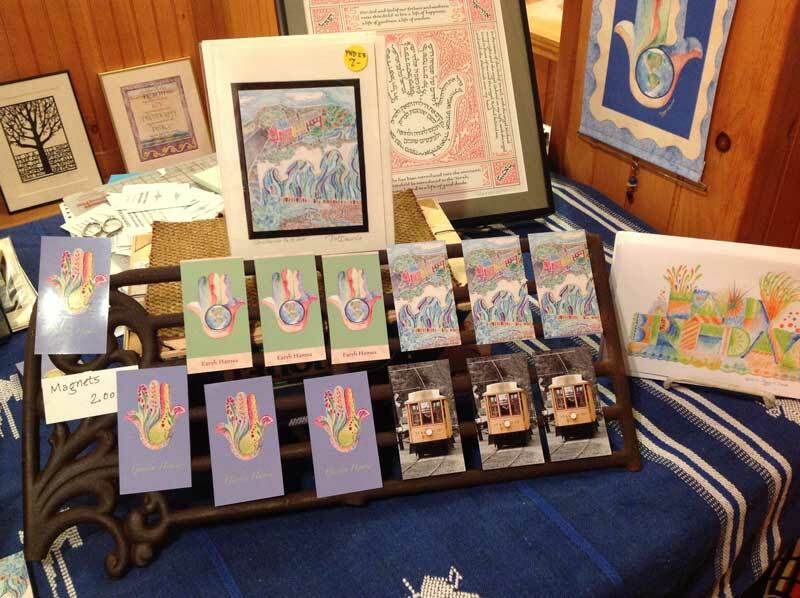 The Shelburne Falls drawing can be seen behind the magnets on a card, $7.00, framed baby amulet behind that, hamsa hanging on the right. Shown here, two of four inspirational, motivational quotations. Available on cards, $7.00 each, or as a giclée print, 13.25 x 8.25,” in an acetate envlope. Featured today: full set of hand-rolled beeswax Chanukah candles, $26.00. 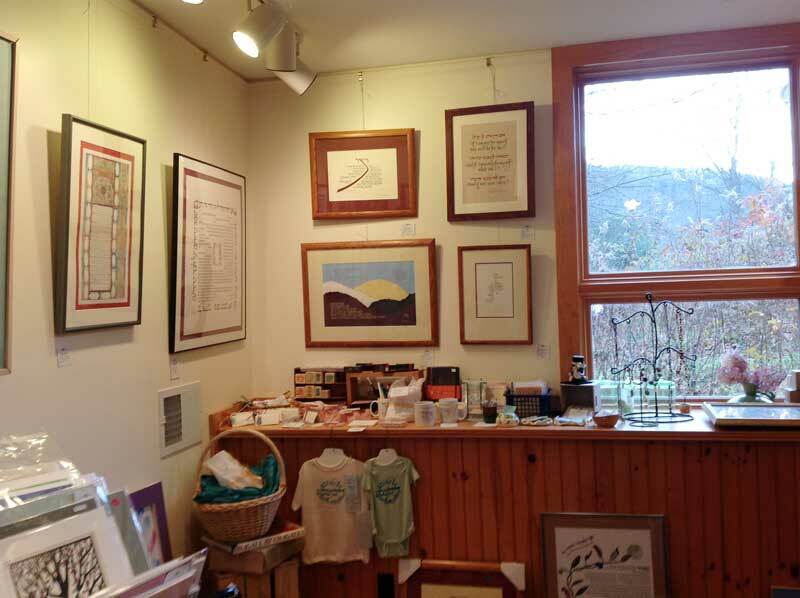 Sunday Nov. 10 was the day of the Crafts of Colrain Studio Tour that our Ganeydn Gallery was open, and I want to thank everyone who visited us as part of the tour. We met many new people and I enjoyed sharing my calligraphic art and the new fiber art I’ve been doing, and Joe showed many of his nature and train-based photographs. I’ve included here a photograph of the studio and will add some more photos of items, especially new ones, in the next few days. Subscribe to this blog so you’ll receive immediate notice of any photos and posts. I gave a 10% discount for the tour and will hold it until Thanksgiving, so if you see something you’d like to order, you’ll receive 10% off the cost of the items you order. 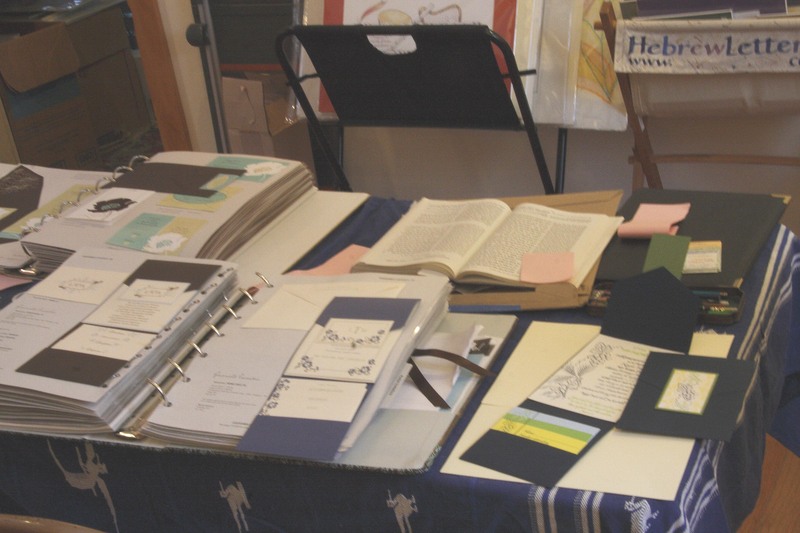 A recent invitation I produced is a gateway fold: folded on both sides so the paper meets in the middle. 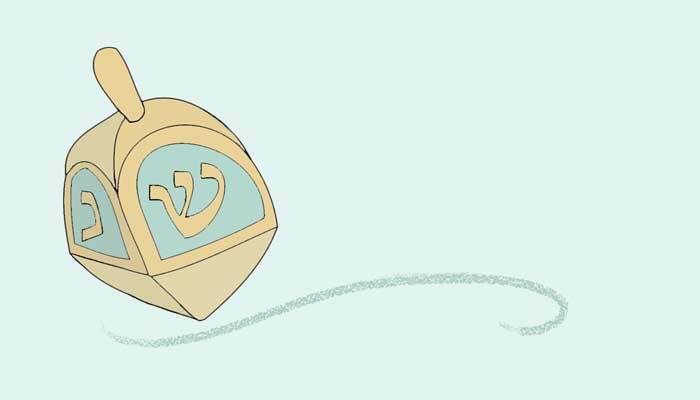 This star, cut out of a sheet of blue paper and with the Hebrew name Aliza cut out from the star, was glued partly on one flap so it crossed the line where the two flaps meet. It is a variation of the “Ki Tavo” example on my invitation web page: http://www.ganeydn.com/kiTavo-invitation-set.html, which had the name printed on the star. I’d like to post a picture of it, but I’m having a hard time figuring out how to do so. I’ll post the whole invitation when I’m able. Shown here: pocket folder with invitation attached; four insert cards: rsvp, directions, brunch, evening party; tab on flap shown upper left, rsvp envelope lower left. This is the first pocket invitation set I designed. As I was the customer, I made it a rather complex project. This included using for the first time a letterpress printing set that I got in the spring, a small model that sits on the table. I lettered the text, drew the border, and had a plate made to use with this press. I found that applying the ink takes practice. I love the look of the impression in the paper. I used that for the invitation cards, which were adhered to the folder. The other items also used my lettering and design, but were printed by a commercial invitation printer, http://www.phdcalligraphy.cceasy.com/. I was wise enough to know I wouldn’t have time to hand-press each item. They were then all assembled, some of them using more insert cards that others, depending on whether they were out-of-town guests or not, and put into the envelopes which we addressed using our computer printer. It was a great learning experience, and a pleasure to create. The invitation season has begun. 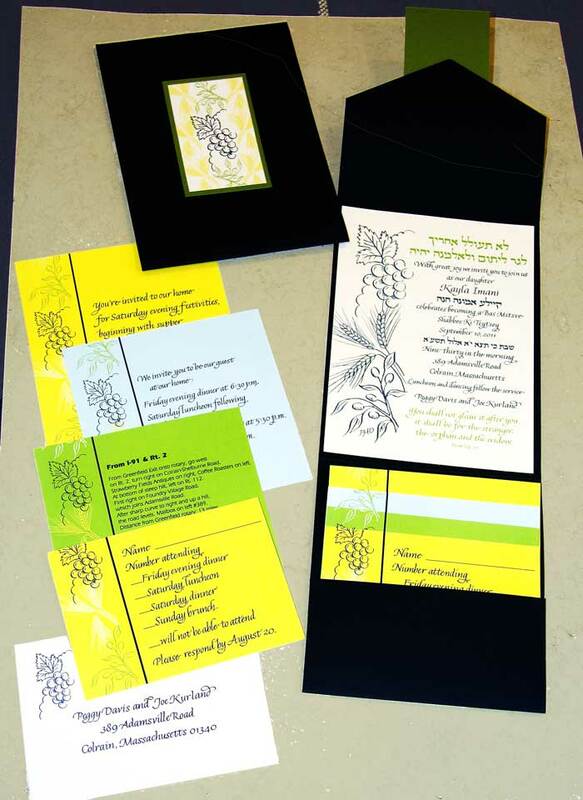 I had a great session with a customer–the whole family–for a bat mitzvah invitation. 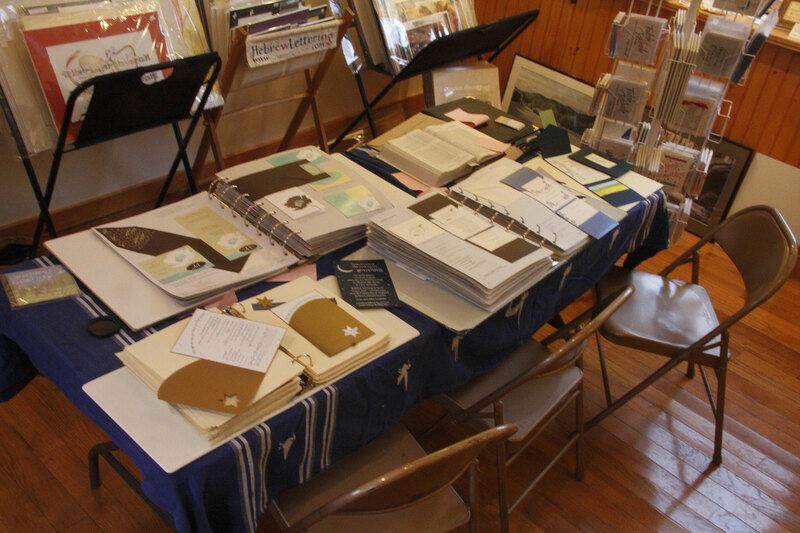 The photo shows the table with all the materials we referred to for this project. It is always a fascinating process which is at first overwhelming, but the preferences become clear soon enough. While I work with customers all over the country, thanks to the internet, phone and mail, it is great to meet in person. 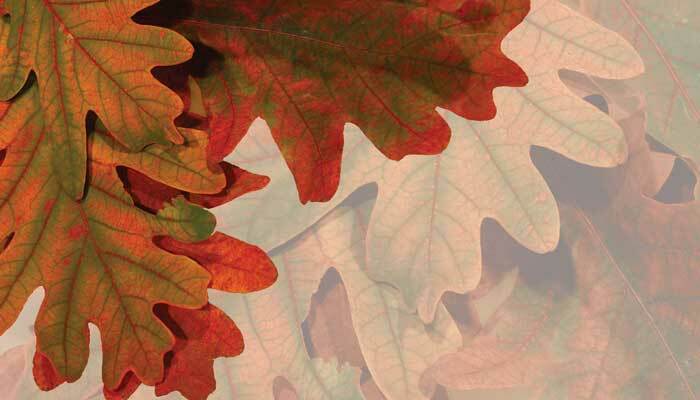 I’m glad to be able to offer this to those in the Greenfield-Shelburne Falls-Amherst-Northampton area, as well as to those in Western Mass., Connecticut and Vermont who are able to travel here. Pocket invitations are so appealing, providing a neat packet which holds the invitation on one side and all of the smaller insert cards of an invitation sets in a pocket on the other side. This packet goes into an outer mailing envelope. Pricing will vary depending on how many cards there are in the set and whether or not I provide original art for it. $600-1200 would be an approximate price range for 100 invitation sets with this pocket format depending on the choices you make. Pocket album open on lower left; pocket invitation I produced this summer on right. 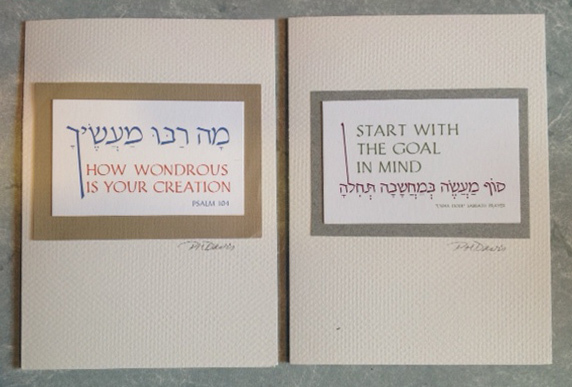 I’m getting excited about this year’s Crafts of Colrain Studio Tour, Nov. 12-13, 10-5 p.m. My studio will be open only on Sunday, showing my calligraphic work and jewelry plus a few more things, and Joe Kurland’s photography and Yiddish songs & klezmer music. http://www.craftsofcolrain.com has a map, list of artists, places to stay and all you need to know to have a good day(s) in Colrain. A new product for this year are gift cards. I had two designs printed, and when they arrived I got inspired to create some one-of-a-kind collage cards as well. I have a new card rack for gift cards, and it’s already full!